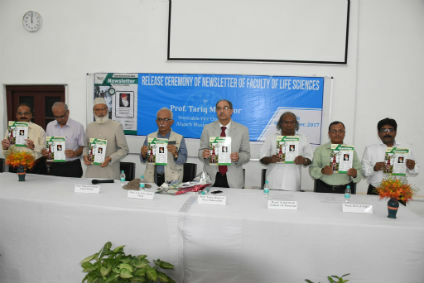 Aligarh: The News Letter of the Faculty of Life Sciences, Aligarh Muslim University (AMU) was released by AMU Vice Chancellor, Prof Tariq Mansoor at a special function held at the Department of Biochemistry. While appreciating the initiative for getting a news letter published, Prof Mansoor advised the faculty members to upgrade the news letter into an academic journal. The Vice Chancellor commended the contribution of Faculty in publishing a very high number of quality research papers and for conducting a number of research projects. He emphasised that the research facilities and equipment should be shared between department research laboratories and scholars. During the welcome address, Prof S Asif A Naqvi (Dean, Faculty of Life Sciences) discussed the importance of publishing newsletters. He related the effort to carrying forward the legacy of the AMU founder, Sir Syed Ahmed Khan. Prof Naqvi pointed out that Sir Syed had established a ‘Scientific Society’ and started publishing the Aligarh Gazette. Prof Masood Ahmad (Chief Editor, News Letter) deliberated the achievements and recognitions of students and faculty members saying that their work should be documented for wide circulation. He paid vote of appreciation to the efforts of editors, Prof. Irfan Ahmad, Prof. H.S.A Yahya, Dr. Mohd. Irfan and Dr. Anwar Shehzad. Addressing the gathering, Prof. S.M. Hadi (Emeritus Prof), who attended the function as the guest of honour said that teaching efforts with research should be of paramount importance. He urged faculty members to generate new research works. Senior faculty members such as Prof. Saeed A. Siddiqui, Prof. Wajahat Hussain, Prof. Shahid Siddiqui, Prof. Humayun Murad, Prof. Azeemuddin Qureshi, Prof Riaz Mehmood and Mrs. Bilqees Bano were present on the occasion. Prof. H.S.A Yahya conducted the programme, while Prof. Qayyum Husain proposed the vote of thanks.